Natalie, a hs senior, showed me her newly-painted bedroom in July. She chose two soft shades of grey and purple and gave me permission to do whatever I wanted as long as the new quilt had the texture of her old quilt, which I made for her when she was 5. She sleeps with it every night. At that time of my quilting, I was batting everything with Warm And Natural. So that's what I batted this quilt with. I'm not quite sure why I went asymmetrical - there is nothing asymmetrical about Natalie. She's very smart, very sociable, very very pretty, and very hard working. It's a joy to create and work on a quilt for someone I love so much. I do hope she understands that this new quilt, backed in the softest white cotton, will need to be washed at least a dozen times before it even begins to feel like her old quilt. I have washed this new one once and just love the texture. The quilting is simple with (mostly) straight lines. This new quilt is 74" x 90". 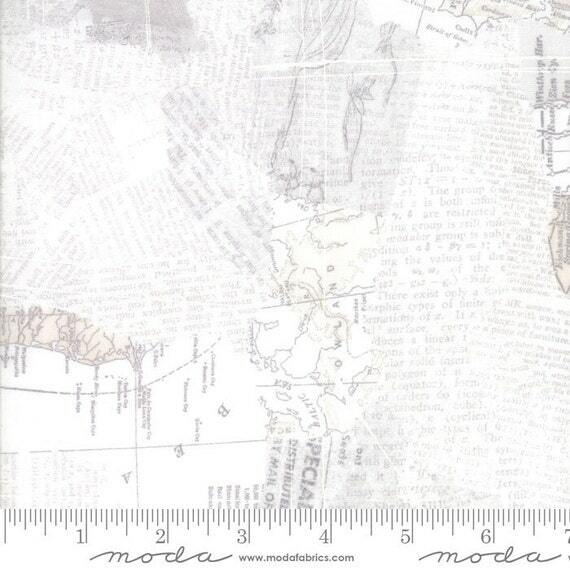 The background fabric is Basic Grey by Moda, maps white. There's a very quiet design that is just perfect for this quilt. Here's a close-up of it. Natalie turned 17 on August 8 - I thought maybe this quilt might be a birthday present. Then I thought, "Maybe it can be her back to school quilt!" And obviously that didn't happen. So, Happy September, Natalie! The next quilt in queue is for her big sister Nikki, a junior at IU. Nikki wants a quilt inspired by the NYC skyline. Hmmmm, ok - officially thinking about it!